Summer sabbatical is over! We are already knee deep in all things fall:) I had a great rest and read many books, and while I'm still praying over my blog format here, one thing I'm 100% on is Bookshelf Fridays! Reading and writing are two of my largest loves, so shouting out about amazing authors and great reads will always be something I do. 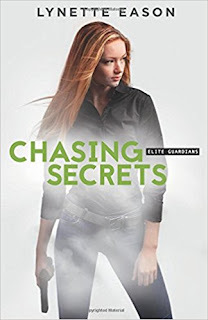 Let's start off with Chasing Secrets by Lynette Eason. Here's a short blurb, and we'll chat on the other side! Let me start by saying this is the final book in a series. Let me follow that by saying you do NOT need to have read the others to pick this one up. Oh, reading every book in the series always rounds the storyline out for you, but it is not necessary with Eason's books. I picked this one up only having read book number 1, and I absolutely enjoyed every moment of this read! Eason is a master with twists and turns that keep you turning the page. She has a way of making your heart race without freaking you out. Her main characters are always strong and well matched--and this book remained true to that. I thoroughly enjoyed the idea of women bodyguards who were smart, trained, and still accepted help while maintaining that strength. And in this story, I loved Haley's past and how it comes to light. It was intricate and handled believably. The touch of romance was sweet as well, evenly creating a balance between love and mystery. All together, a book I thoroughly enjoyed. For a romantic suspense that is fast-paced and keeps you up at night for all the right reasons, you'll love Chasing Secrets. You can pick it up here. Happy Fall, Susan. Thanks for sharing Chasing Secrets. I always enjoy Lynette Eason's books. Me too! She's a phenomenal writer:) Happy fall to you too, Jackie!